When lives and property are at risk, you need Crowcon gas detection equipment. Crowcon has supplied reliable, high quality products for over 45 years and have built up a reputation for its reliability and technical innovation. Crowcon supply both single and multigas monitors for both personal monitoring and portable safety applications, this provides protection against a vast range of industrial gas hazards. It is Crowcon's philosophy that ever model must be properly suited to its task, so that it can meet the needs of the user. T4 offers a low cost of ownership, whilst also providing compliance and robustness in a simple to use solution. T4 integrates innovative safety features and a rugged design which provides substantial protection for those working in unforgiving environments. This easy to use, portable gas detector protects against all four of the most widespread gas hazards: carbon monoxide, hydrogen sulphide, flammable gases and oxygen depletion. 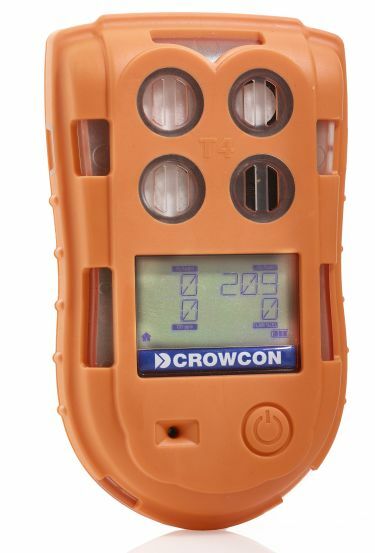 This useful feature, which is completely unique to the Crowcon T4 ensures that toxic gas exposure is calculated accurately over an entire shift, even if the device is switched off during a break or whilst it is being relocated to another site. The advanced 24 hour battery life allows you to work much longer shifts in between charges. 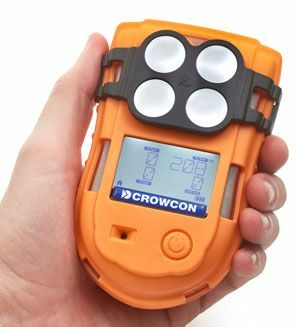 The Crowcon T4 includes a backlit display which is clear and easy to read, it also has a flipable screen which turns 180° making it easily viewable whilst being worn. The T4 has been drop tested from 4 metres onto a concrete surface and has a anti-shock rubber case. It is also water and dust resistant to IP56 and IP67. A simple 'traffic light' system reassures the user that the device is working safely and correctly, and is easily recognisable just from a quick glance, displaying a green light for when it is working fine and a red light when something is wrong. Approved for ATEX Zone 0 and UL and also Class 1 Division 1 for its operation in the most extensive range of environments. The T4 is equipped with individual sensors for every gas, this ensures quick, reliable detection. An audible 95db alarm gives an easily recognisable warning to gas hazards, along with vibrations and vibrant blue and red LED's. The Crowcon T4 has an easy to use menu system and large single button enable the user to operate with or without gloves and also means that very little training must be provided before use.